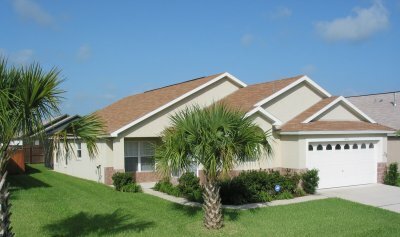 Welcome to our Orlando Florida vacation villa. 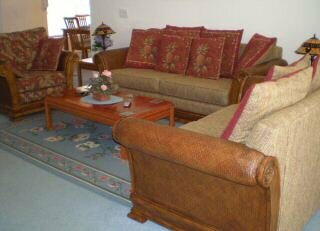 It is a 4 Bed, 3 Bathrooms holiday home with private pool. View the details below to see why vacation rental is so popular. Luxury home in Florida and close to Walt Disney World ! 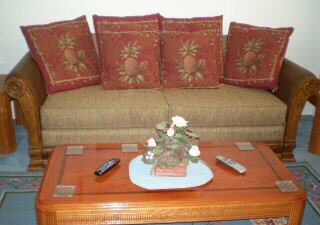 The spacious living area has a three seater settee, a love seat and a single seat. 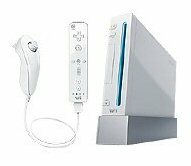 The entertainment unit consists of a large Cable Television, a Video, a CD HiFi and a Nintendo Wii. 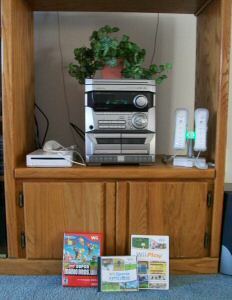 There are various DvD's / Video Tapes, Board Games, Building Bricks and a Child's Play Cube. The large kitchen is fully equipped with everything you would wish for to make your stay in our Orlando villa as pleasant as possible. Includes a large fridge/freezer with ice maker, dishwasher, microwave oven, gas hob, electric oven, coffee maker, electric can opener, double toaster, etc. 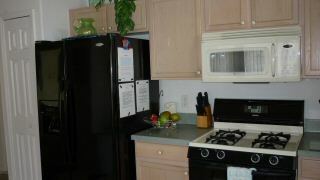 On the right of the picture in the kitchen is the high chair. 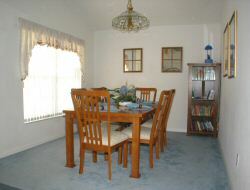 Dining Area for more formal meals. Whether you are cooking in, ordering from outside or just finishing off the famous "doggy bags" from the restaurants there is plenty of room at the dining room table. 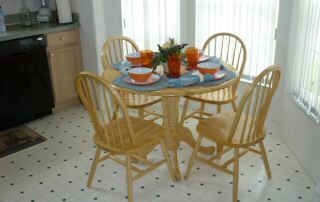 The place setting is for six but extra chairs can be used from the breakfast table shown above. 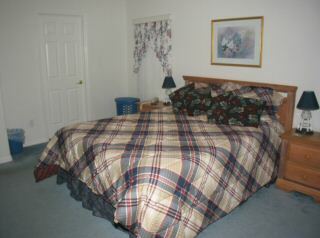 Large Queen bed - Cable TV and video, telephone, clock radio. 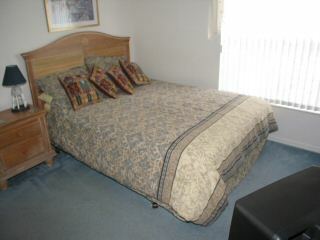 Large Queen bed - Cable TV and video, clock radio. 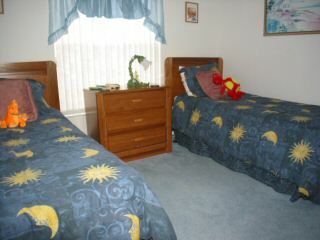 This bedroom has twin beds, and has a window looking out onto the swimming pool. This bedroom has twin beds. There is a bathroom located between the twin rooms. 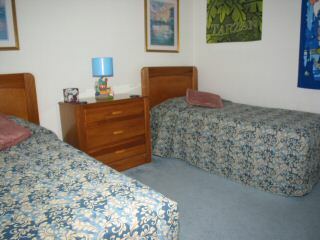 All towels and linen are provided for use within the Villa. The pool is private and the area is secluded by a fence. 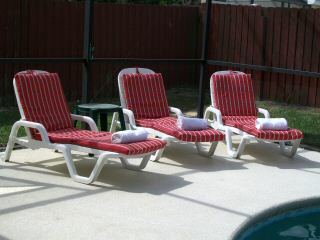 An excellent location ensures it enjoys the sunshine from early morning until sundown. The lanai (recessed area) has a table and chairs so that you can eat and drink out in the Florida sunshine. There are also sun loungers and a Little Tikes bench. A cool box for drinks and plastic crockery and glasses are provided for the pool area. All entrances to the pool area are alarmed for the safety of younger guests. 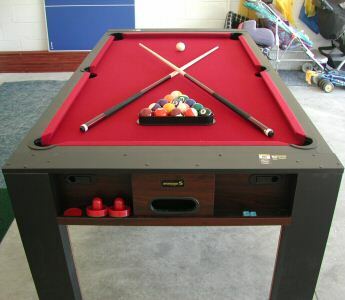 Pool Heating - Note that as an optional extra the pool can be heated during the cooler seasons.